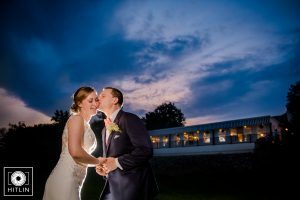 This summer we hosted yet another amazing wedding at the Glen Sanders Mansion. 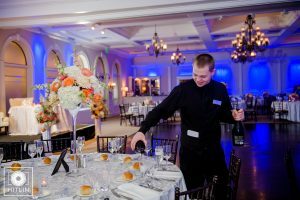 When we looked through the pictures from the wedding photographed by Hitlin Photography we thought….how can we not reshare these gorgeous photos! 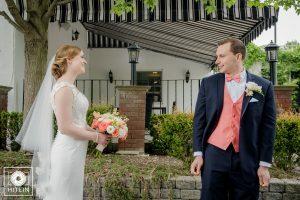 The couple we’re spotlighting today is Michelle & Michael. Here’s to wishing the happy couple endless years of joy! 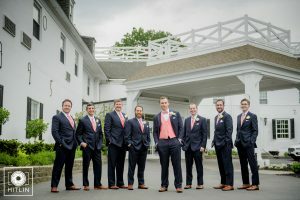 The first look photos are always a personal favorite. 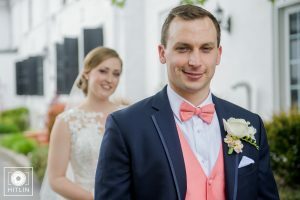 We’re so glad Hitlin Photography was able to capture the first moments where the soon to be wed gaze on each other just before the ceremony. There is nothing sweeter than the look on a grooms face when he realizes that the gorgeous lady he’s staring at is about to be his wife. After the first look came the ceremony! The moment you and all your family and friends have been waiting for. All the planning, prepping and hard work comes down to that one amazing moment where the happy couple says “I do”. 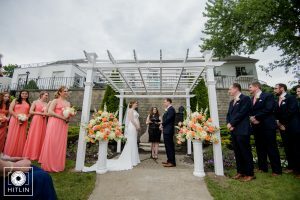 Michelle and Michael looked gorgeous (of course) standing under the trellis in our newly renovated ceremony area on the lawn. 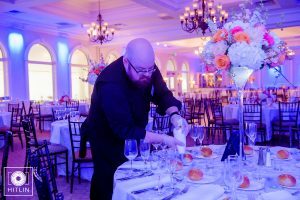 Might I add, this was the perfect color scheme chosen by the bride and groom – pinks, oranges and warm tones are always an excellent choice for a summer wedding. Next stop after the ceremony is the photo-shoot. 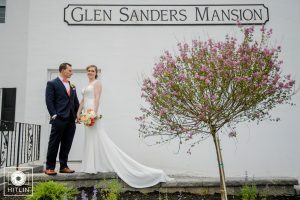 We love when our brides and grooms get photographed in front of the iconic and historic Glen Sanders sign. The all white background looks amazing in contrast with the flowers and couple and her gown still manages to pop! 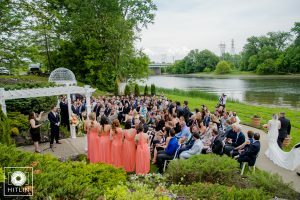 One of our other favorite shots is this one overlooking the pond area and gazebo. 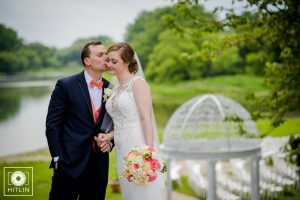 The perfect naturey background for your wedding photos. 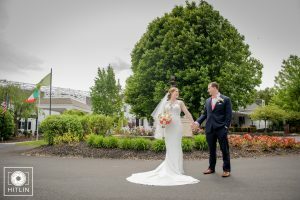 If we can promise you one thing about this venue, it’s that there is no shortage of special places to capture your wedding memories. And of course some great shots with the wedding party…. 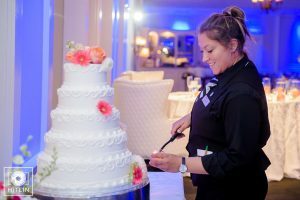 While the couple and their party were off taking photos, our staff was hard at work making sure everything was perfect. The Ballroom looked amazing as always! After the photo-shoot came the big entrance into the reception area – and what an entrance it was! Michelle and Michael swooped in and took over the dance floor with a big dip and an even bigger kiss. 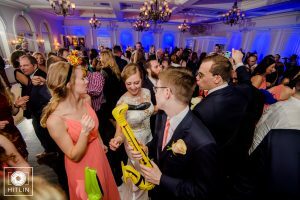 After that the couple and their guests enjoyed some dinner and cake, and danced the night away! 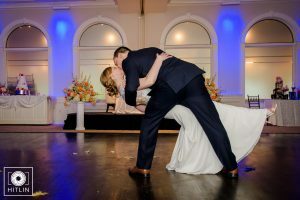 Michelle and Michael managed to slip away from the dancing inside for a night shoot as the new Mr. and Mrs.
We are so thankful for amazing photographers like Hitlin, these shots are too beautiful to not be shown!